1. 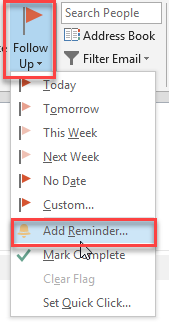 Select the email message that want to set the reminder for. 2. Select Home > Follow Up > Add Reminder. 3. In the Custom box, for Flag to, select Follow up or type a description. 4. Check the Reminder box, enter date and time, and then select OK.
An alarm bell icon will appear on the message. Note: To change the time for the reminder, select Follow Up, select Add Reminder, edit the time, and then click OK.